Well I’m back home to the flat ground, huge paddocks filled with turning crops and the buzzing of flies! I missed home but I had a ball in Italy. We had a stop over in Doha so we stayed a night and explored. Amazing place with so much money! It was great to have to day to see the sights and the people were so lovely and helpful. Favourite spots were the Souq Wagif (local market) with its spices, and smells. Where men wear their thobe (long white shirt) with a red and white gahfeya on their heads and women in their black abaya. The buildings here were amazing, every one different and we went to the huge shopping centre Villaggio that has its own canals with gondolas, ice rink and games centre with roller coaster etc. And the ceiling was great, made everything feel big and spacious. 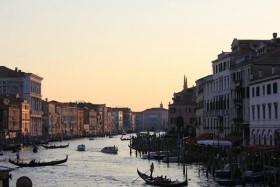 Then we flew to Venice and onto a water taxi.